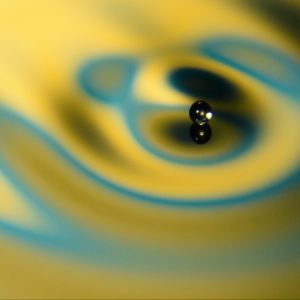 A small droplet that falls on a liquid interface sometimes behaves like a ball dropped onto the ground: it bounces several times before eventually coming to rest. Ultimately, it merges with the underlying liquid due to gravity. Droplet bouncing is crucial to many industrial processes, including spray coating, fuel injection and surface cooling. On more fundamental grounds, we study the rebound of droplets on a vertically vibrated liquid bath. The vibration delays the coalescence, and may even completely suppress it: the droplets then bounce indefinitely. These droplets, called walkers, get a horizontal impulse from the surface waves that they generate at each bounce. Thanks to this wave-particle coupling, the walkers exhibit all sorts of behaviors that are in a way highly reminiscent of quantum particles (including diffraction, tunneling and quantized orbits) and the pilot-wave theory proposed by Louis de Broglie. A review of these phenomena can be found here. We are currently pushing this analogy forward, through a combination of experiments and theoretical modeling. Walker trapped in a circular cavity. For example, we have recently shown that, when confined within a cavity, the horizontal trajectory of the walker becomes chaotic and similar to a random walk in the vicinity of the Faraday threshold. The corresponding statistics on position and velocity remarkably corresponds to the solution of Schrödinger equation for a quantum particle in a potential well. 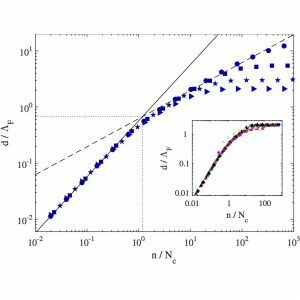 Matching both worlds suggests that the vertical bouncing is analog to the hypothesized Zitterbewegung of quantum particles, while the diffusion coefficient of the random walk is related to the Planck constant. On the short term, the walker’s motion is ballistic, with a speed that corresponds to the de Broglie’s velocity hk/(2πm). But as soon as the walker has travelled about one half of the Faraday wavelength (dictated by the forcing frequency, which is also the bouncing frequency, through the dispersion relation of the waves), its orientation changes. So on the long term, the walker’s trajectory is closer to a random walk, of diffusion coefficient equivalent to h/(2πm). 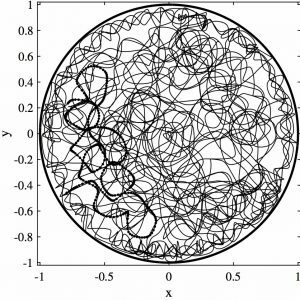 Chaotic trajectory computed from a toy model of wave-particle coupling. Average distance d travelled in a number of rebounds n. The motion is first ballistic with a speed that corresponds to the de Broglie velocity hk/(2πm), then becomes diffusive (random walk) with diffusion coefficient equivalent to h/(2πm). The transition occurs when the walker has travelled approximately half the Faraday wavelength. 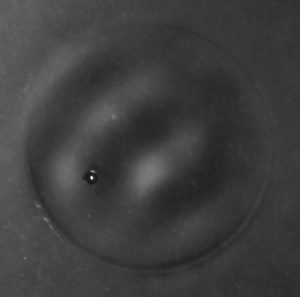 We have also investigated the behavior of bouncing droplets on a bath vibrated with a combination of sine waves at 64Hz and 80Hz. A wide variety of periodic bouncing modes are observed depending on the amplitude of each forcing frequency. 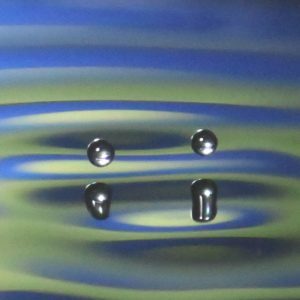 When both amplitudes are sufficiently high (and just below the Faraday threshold), the droplet starts walking chaotically. So the walker’s motion can be chaotic even in the absence of wave confinement. Again, there is a characteristic length of persistence of the ballistic motion, closely related to the average Faraday wavelength of both frequencies. Droplet walking on a bath vibrated with a combination of 64Hz and 80Hz sine waves. The bouncing mode is complex but nevertheless periodic. Jerky motion of a walker forced with two frequencies, observed by superimposing successive top views. With Peter Schlagheck’s team, we rigorously derived, from Navier-Stokes equations, an approximation for the subthreshold Faraday waves emitted by walkers. We have shown that there is a finite range of excited wave numbers, called the Faraday window, for which the corresponding frequency locks on half the forcing frequency, thereby producing subharmonic stationnary waves. Very close to the instability threshold, some wave numbers are almost not damped, so the corresponding waves remain on the bath during several droplet impacts. This memory of successive impacts, encoded in the wave field, is a key ingredient present in most quantum-like behaviors of walkers. From there, we could also derive the damping length of such waves emitted by a point source, beyond which their amplitude becomes negligible. This length can be seen as the effective lateral extension of the walker, i.e. the distance at which it can probe its surrounding (obstacles, other walkers). Interestingly, this damping length diverges when viscosity vanishes, which suggests that in a dissipation-free system (as it would be in the quantum realm), the extension of the walkers is infinite, i.e. they are intrinsically non-local. 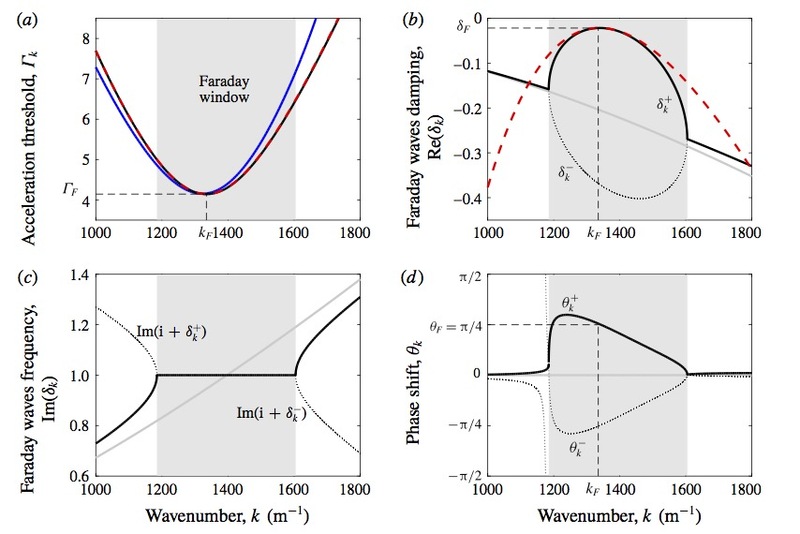 Faraday window, in terms of instability threshold, damping, frequency and phase shift. For more information, visit the website of our project QUANDROPS .